Sometimes you have journeys that remind you that life isn’t for sitting staring at a device. Last night on a packed, delayed train home to Brighton the chap next to me asked me if I did this every day. I explained I did and we got to talking. 40 minutes later after having talked about (among other things) both visiting St Petersburg in 1993, the downsides of boarding schools, the best places to eat in Brighton and the generosity of strangers, Mike and I parted company. He’s not a commuter so, even though he lives in Brighton, it’s not highly likely I’ll see him again, but he made my Tuesday. There’s no moral or real point to this, other than sometimes it’s good to break out of your routine and do something different, even if it’s just taking to a stranger. How can you design a train with so many mistakes? 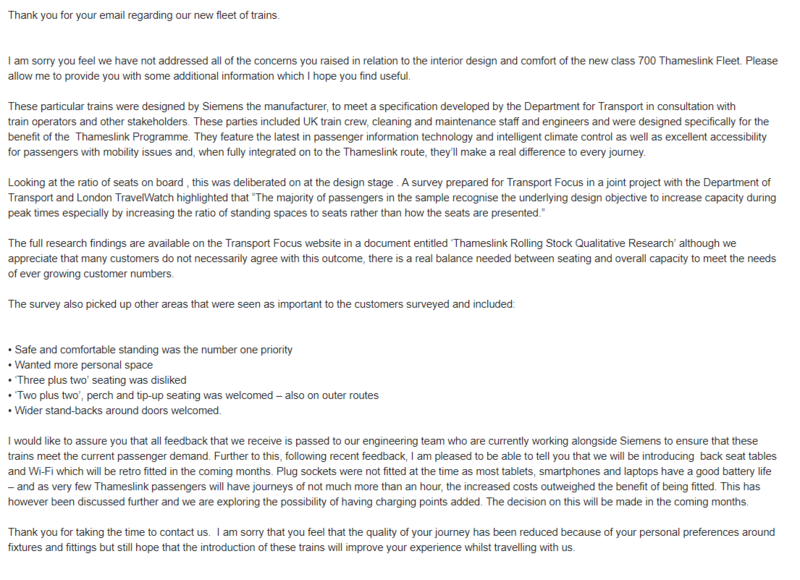 I realised that it was a good 6 months since my last email to Thameslink to find out what was happening with the improvements to Class 700 stock, so I got in touch and had a response last week. You can view the whole response by clicking this link here, but essentially it was full of the same stuff I’ve heard over and over again, about how they followed due diligence when designing the new trains. Interestingly (well, for me at any rate), I discovered that Thameslink don’t actually own the rolling stock, which probably complicates the updates they keep talking about introducing – ie WiFi, seatback tables and power sockets. I also wanted to add – I’m actually changing job in mid February which will result in me driving to work and ditching train commuting after more than 20 years. I’d like to say I’ll miss it, but you know that would be a lie! That’s right, only 14 months after introducing the least user-friendly trains in the world, Govia Thameslink has finally begun to retrospectively fit seatback tables on the new Class 700 services. This is a huge deal, because it finally gives you somewhere to rest your phone / laptop / coffee / book / paper while you travel and begins to right the multitude of wrongs that commuters have experienced with these trains. However, what I’ve also discovered is that it merely serves to highlight how little legroom there is. The new tables are a welcome addition, but it has reduced the space all passengers have to manoeuvre their legs. Anyway, gripes aside, let’s see how long we have to wait for the long-promised power points. *** 30/05/17 UPDATE: I’ve chased up GTR again for further progress and had a new response. For my sins I spend around 15 hours a week commuting on the Thameslink line between London and Brighton. Since the franchise passed to Govia, we have been promised new trains. It now appears we have them. I have got on new rolling stock twice today and my bewilderment over the things that appear to be wrong has only increased. I should acknowledge some improvements. 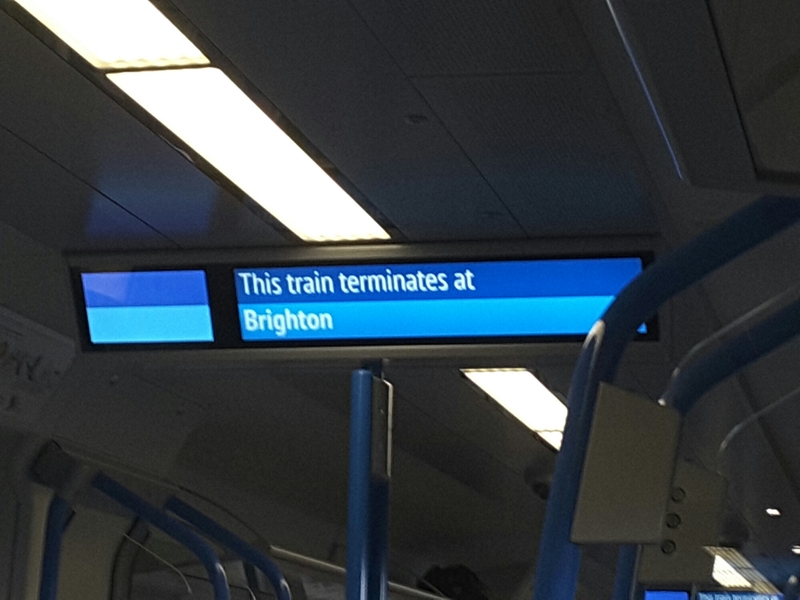 The on board electronic information (see main photo) is much better and clearer, including details on how busy carriages are and whether the on board toilets are working. The awkward interconnecting doors have largely been removed. They were rubbish and broke continually. In two journeys, this is what I’ve noticed so far. 1) The number of seats has been reduced. This seems like an enormous issue. The trains may now be 12 coaches long, but giving people more room in which to stand isn’t exactly a progressive move. Given the frequency with which coaches seem to break I can’t see 12 coach trains being constant. Is this really such a cost-saving against passenger comfort? 3) No increase in baggage storage. The Thameslink line travels to 2 of the country’s biggest airports: Gatwick and Luton. Lots of people use the train to get to and from these airports and travel with large suitcases. 4) Tables and seat back trays removed. These are commuter trains. People spend hours on them (see para 1). This means they want to work to make the most of their time. They will now have to awkwardly balance their laptop on their knees (yes, I know it’s called a ‘lap’top for a reason), which isn’t hugely comfortable. 5) No charging points. Intermediate rolling stock had plug sockets to allow phone/laptop charging. No more! Why would you build something without and then be forced to add afterwards? Where are the user needs in all of this? When you design a new product, you ask what customers want! In a commuter train, you’d be looking for comfort, useful functionality, seats… you get my drift? I get the impression these new trains have been designed with not a single piece of customer feedback. I pay Govia in excess of £4k a year to use their trains. The least they could do is solicit opinons from me (or people like me). Prove me wrong Govia, or at the very least show me what audience research you did. ‘Thank you for getting in touch and letting us know your views on our new Class 700 trains. In regards to your comments on the sockets, most tablets, smartphones and laptops have good battery life – iPads, for example, offer up to 10 hours and laptops between three to nine hours. As very few Thameslink passengers will have journeys of not much more than an hour – with many journeys of only around 30 minutes- it did not justify the large cost and significant weight increase (the trains were specified to be lightweight) that would be incurred installing power points throughout 1,140 carriages. My reaction: what a joke! Don’t put plugs in because everyone gets on a train with a fully-charged device, don’t they? In regards to the tables and seat-back flip-down tables, passenger research for rail watchdog Passenger Focus and London TravelWatch carried out to inform the design of the train showed that people recognised the main priority was to maximise capacity so they were not incorporated into the specification. Seat tables can also slow people down getting on and off trains – and we’ll have just 30 seconds to get people on and off these new trains in central London. My reaction: the thought that people are unable to prepare for their station and that a lack of table gives extra time to get off is ludicrous. The reduced ‘capacity’ no seat back table offers is irrelevant compared to the usefulness of having a table; somewhere to rest a drink, a snack, a book or paper. However, the DfT is exploring opportunities for fitting charging points for laptops and other mobile devices on the new Thameslink trains. A decision will be made by Ministers. The DfT is also working with Siemens and GTR on a proposal to provide seat back tables. These would be retro-fitted to trains that have already been built. My reaction: the subtext here is Govia knows the decision was wrong. Regarding the seats, the design was undertaken by Fainsa, on behalf of First Capital Connect (pre-2014) in conjunction with Siemens. The design is the same as current 387 seats, and a number of other fleets, which have been in service for several years. Its ergonomic design has been created to be comfortable for people of varying heights. The final choice of design was done in conjunction with stakeholders and user groups, such as London Travel Watch and Passenger focus and included testers of all shapes and sizes including those who were over 6ft and comfort improvements were made to the original design as a result of this. The materials and design have been chosen to be hard wearing, being able to withstand usual and unusual wear and tear including vandalism (slashing/burning of seats) and meets all current standards including crash worthiness and fire. I hope this information is of use and please accept my apologies for any inconvenience caused. My reaction: the design may be the same, but they’ve clearly used less padding and the removal of arm rests means they’re closer together. Overall, at least they’ve replied, but they still ignored my questions about arm rests, baggage space and reduced seating. As I understand, the trains were ordered by the previous operator (Thameslink) so Govia didn’t have a say. However, they clearly decided to bite the bullet and not make any improvements before putting them into service. Now they’re probably ruing that decision as they will have to take the new trains out of service in order to retro-fit plug sockets and seat back tables. As it was six months since my last contact with Thameslink, I got in touch again to see how that ‘retrofitting’ was going. 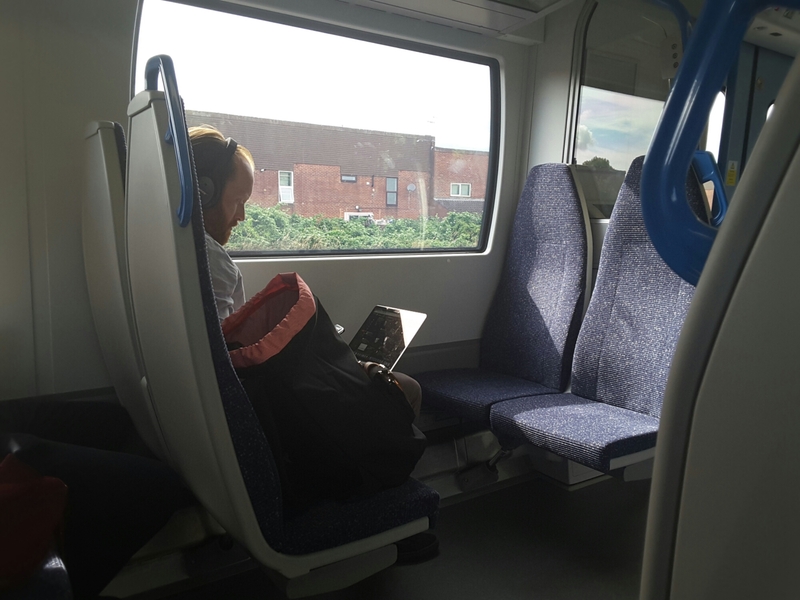 In regards to your query relating to seat back tables, Ministers have committed to the fitting of WiFi and seat back tables to the new class 700 Thameslink trains. Future trains being manufactured by Siemens will include these changes and the Department is holding discussions with Siemens, Cross London Trains (the rolling stock owner) and Govia Thameslink Railway about the best way to retrofit the trains already manufactured. In regards to plug sockets, we are currently still in talks in relation to retrofitting trains as well as adding them to the design of all future trains for this franchise. Essentially, very little has changed. The response above is almost identical to the original platitudes, promising no timescale and no genuine action. Almost a year on from the arrival of the new rolling stock, we appear to be no closer to the appearance of charging points and seatback tables. Author robPosted on July 29, 2016 January 23, 2018 Categories commuting90 Comments on How can you design a train with so many mistakes? Monday morning was no different to any other for me and many hundreds of thousands of commuters – a journey punctuated by delays. As my Southern Rail train arrived at London Victoria more than 30 minutes late, I pleaded (at volume) with the 50-or-so fellow travellers to ensure they claimed back a portion of their train fare, because of the delay. And with the latest round of rail increases announced today, this will only become ever more important to do. You see, few but the most-hardened of commuters bother to take advantage of any transport company’s poor timekeeping. Are companies bound to pay us? The simple answer to this question is YES – providing the delay is severe enough. As Which? explains, all operators have different rules, but the fundamental right to compensation is laid out in the National Rail Conditions of Carriage, namely a minimum 20% of your single ticket, if you are more than 1 hour late. As Which? says, all companies are different. For example, Southern Railways (with whom I travel) offer a partial refund on delays of 30 minutes or more. As my ticket is an annual season, the complex calculations result in compensation of a mere £3.70 for a 30-minute delay. However, imagine if every commuter made a claim. A single, 10-car Gatwick Express train has 692 seats. On a crowded journey, add on an extra 100 for those standing and – rounding up – you reach 800. The chances of every passenger having an annual ticket is non-existent, but for argument’s sake, let’s say they do and they all come from Brighton. That’s a total train compensation of £2960. Yesterday, pretty much every train for a 2-hour period was delayed (I have Twitter buddies who travel and feed me info). At the very least, that’s another 10 trains. If we do the same calculations and then multiply by 10, you get a compensation figure from 1 morning and 1 route alone of £29,600. I don’t keep a definitive log of train delays, but I think it’s fair to say that there’s at least one a month that can be claimed for, so multiplying our one-off figure by 12, you get £355,200. That figure is based on every passenger claiming for just one 30-minute delay of 10 trains on a single route, once a month for a calendar year: £355k. How many claims are there? It’s difficult to get exact figures, but according to Kent News back in September, there are 100 claims per day for Southeastern Trains delays. That sounds impressive, doesn’t it? Well, not if you read a bit more carefully. Even he doesn’t bother to claim every time: “I’ve only claimed once when I could have claimed half a dozen times or more. There are others I know who don’t claim either”. The two overriding factors are simple: ignorance and difficulty. In spite of their protestations (I’m sure), most rail companies clearly don’t make a huge effort to advertise their ‘Delay Repay’ schemes. Sure, there’s a shiny page on the website, but it’s not front and centre when they’re apologising the next day after major delays. Most people also think it’s difficult to claim, too. Admittedly, the hassle of going to the ticket office and getting a form, filling it out, etc, might be a bit painful, but 5 minutes effort for ‘free’ money? What’s more, with the proliferation of smartphones it’s easy to do it on the go. You can upload a photo of your ticket direct from your phone and, if you’ve registered with the website, they pre-fill your details. My journey will cost me 4.1% more next year, than it does this year – an increase of approx £13 a month. I don’t claim to understand the justification for the increases. Southern, to take my operator as an example, increased passenger journeys in 2011-12 by 7.4%, but – and here’s the kicker for the likes of you and me – overall operating profits dropped by 4.9%. The important thing to note here is not that there was a loss, just a drop in profits. Go-Ahead Group (Southern’s owners) still made an awful lot of money – just not quite as much as before. If you’re reading this in London and you think this doesn’t apply to you, then you’re wrong. Transport for London also operates a rarely-talked about compensation scheme for journeys delayed by 15 minutes or more. My point is, if you’re delayed make sure you claim your money back – it’s your right and not enough of us are doing it. It won’t make any difference to the price rises, but it might make you feel a little better.